The post 9 Irish Dog Breeds to Celebrate St. Patrick’s Day by Caroline Coile appeared first on Dogster. Copying over entire articles infringes on copyright laws. You may not be aware of it, but all of these articles were assigned, contracted and paid for, so they aren’t considered public domain. However, we appreciate that you like the article and would love it if you continued sharing just the first paragraph of an article, then linking out to the rest of the piece on Dogster.com. They say, “If you’re lucky enough to be Irish, you’re lucky enough.” And if you’re lucky enough to share St. Patrick’s Day with an Irish dog, then you indeed have the luck o’ the Irish. Join us in this celebration of Irish dog breeds — you may find yourself green with envy! 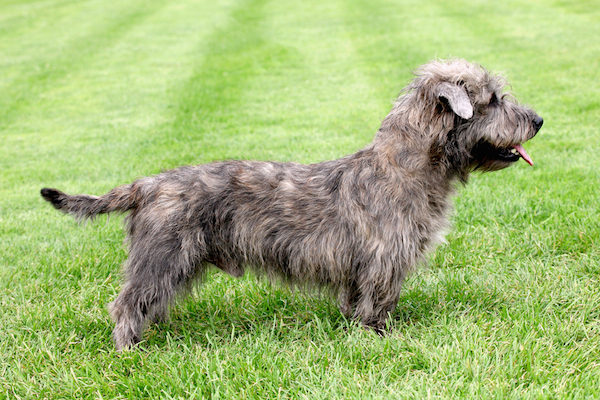 A Glen of Imaal Terrier is among the Irish dog breeds. Photography by capture light / Shutterstock. If you saw this fellow on the street, you might assume he was just a jaunty mutt, but the Glen of Imaal Terrier is actually one of the first breeds of dogs recognized by the Irish Kennel Club, back in 1934. The American Kennel Club didn’t recognize this Irish dog breed until 2004, and it’s still one of the rarest AKC breeds. This Irish dog breed’s claim to fame? He may be the last descendant of turnspit dogs, kitchen-help animals who walked for hours inside a round drum to turn cooking meat on a spit. But this tough guy has also been used for vermin control and can pull a badger from its den. 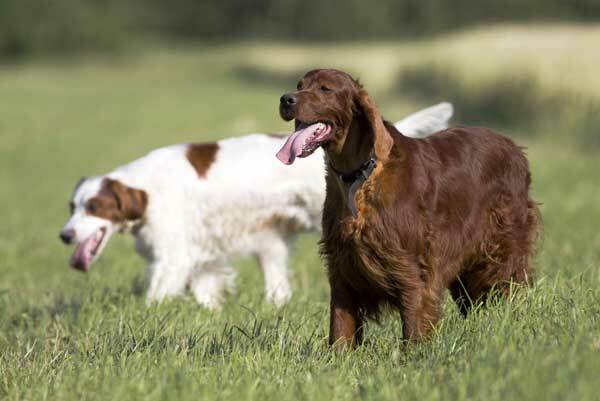 An Irish Red and White Setter with an Irish Setter. Photography by Reddogs / Shutterstock. Ah, one of the lesser-known Irish dog breeds! Everyone knows the exuberant Irish Setter, but far fewer know his direct ancestor, the somewhat more stately Irish Red and White Setter. The Red and White Irish Setter has been around since at least the 17th century, but by 1900, those who were solid red won out in popularity (and became today’s Irish Setter), and the patched ones were almost extinct. Realizing the breed was about to be lost, efforts were made after World War I to revive it. The AKC recognized them in 2009, but they’re still quite rare in America. 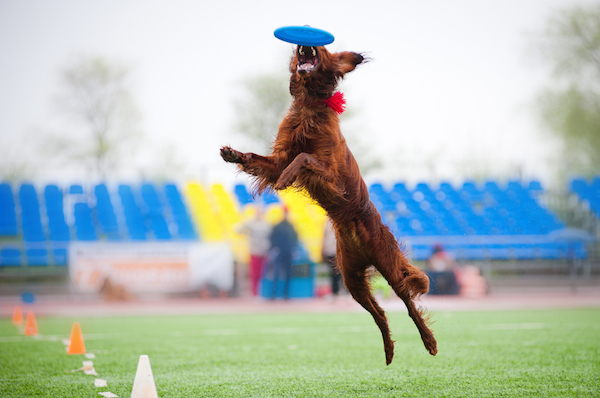 The Irish Setter is an Irish dog breed who loves to party! Photography by Ksenia Raykova / Shutterstock. The rollicking Irish Setter is an obvious choice for this list of Irish dog breeds. This breed never met a person he didn’t want to party with, and St. Patrick’s Day is definitely his favorite day of the year! In the 1970s, the Irish Setter rose to rank among the most popular breeds in America, but like so many superstars, his popularity has since declined dramatically. The best-known Irish Setter was the fictional “Big Red,” but a real-life show dog named Champion Milson O’Boy captured America’s imagination in the 1930s, and he could be considered the most famous show dog of all time. This Irishman has shared the White House with three U.S. presidents (Nixon, Truman and F.D. Roosevelt). 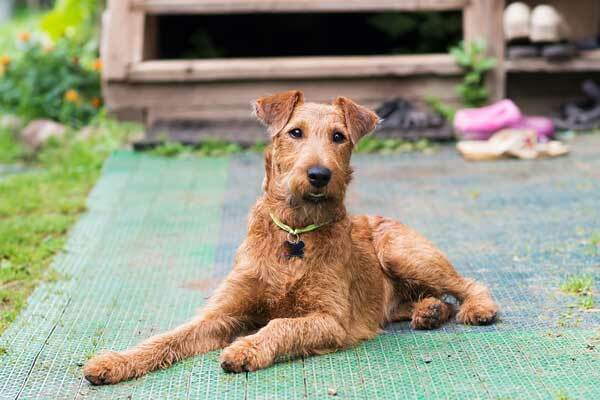 The Irish Terrier is among the Irish dog breeds. Photography by Elina Leonova / Shutterstock. Aptly dubbed the daredevil of dogdom, the red-haired Irish Terrier — like any self-respecting Irishman — doesn’t back down from a challenge. One of the oldest terrier breeds, he was used for hunting vermin, but later even served as a sentinel and messenger in World War I. Although he was once one of the most popular terrier breed (probably accounting for his appearance in several Jack London books), this classic is now one of the least popular. 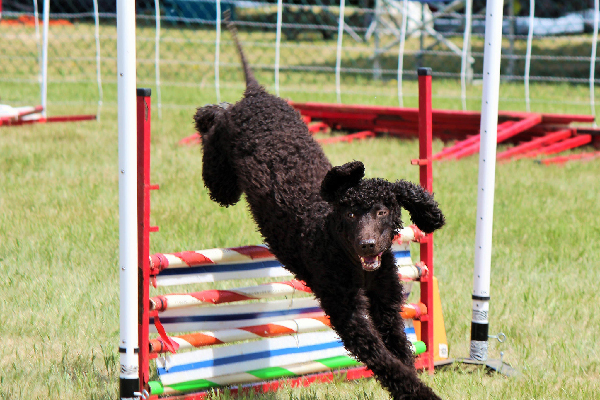 An Irish Water Spaniel. Photography by Marcia O’Connor via flickr.com. Some modifications to size have been made to fit the specifications of this site. This may be the oldest of all spaniels, dating back at least to the 1100s. And in the late 1800s, this Irish dog breed was the third most popular sporting breed in England. But they’re amongst the rarest of breeds now, and most people who see one assume she’s some sort of Poodle derivative with a rat tail. This is a fun-loving sportster always ready to dive right into water or adventure! 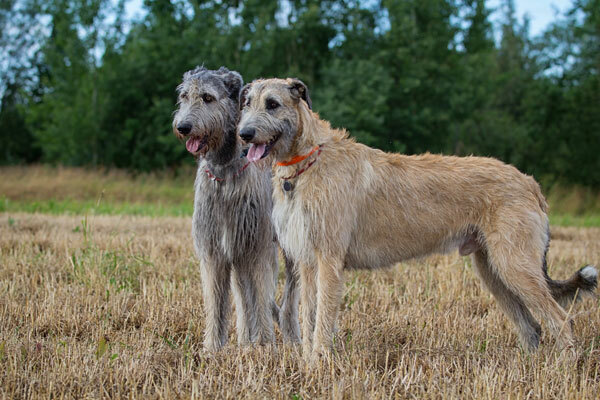 The Irish Wolfhounds are called Cu Faoil. Photography by DragoNika / Shutterstock. Irish chieftains used this tallest of all breeds to hunt wolves and Irish elk, and to present to foreign nobility as gifts. The Irish name for them was Cu Faoil; “cu” is a term implying bravery. Almost extinct in the 1800s, the breed was reconstituted with crosses to other large breeds and is now one of the most popular of all sighthounds. This cool and calm Irishman has made his presence felt at the side of American leaders such as President Hoover and celebrities such as Rudolph Valentino. The rarest of the Irish dog breeds, the Kerry Beagle isn’t the Beagle we usually think of. It’s much larger, up to 24 inches tall and 60 pounds in weight. It dates back to the 16th century, but its numbers have steadily declined since the 1800s until only one major pack remains, the Scarteen of County Limerick. According to local legend, when Noah’s Ark rested against the highest peak in Tipperary, two black and tan hounds jumped off in pursuit of a fox, eventually giving rise to the breed. Irish immigrants brought Kerry Beagles with them to America, and the breed is probably behind several Coonhound breeds. 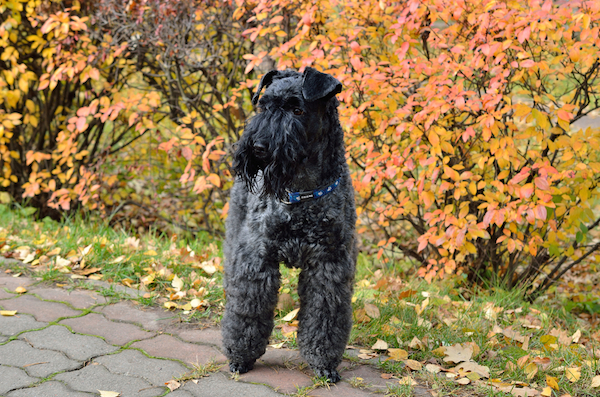 The Kerry Blue Terrier. Photography by vgorlitsky / Shutterstock. The Kerry Blue was the first breed recognized by the Irish Kennel Club. It originated around the Ring of Kerry in Ireland in the 1700s. It was an all-purpose farm dog, hunting vermin, small mammals, and birds, and also herding cattle and sheep. It’s even been used as a police dog. Irish nationalist leader Michael Collins had a famous Kerry Blue Terrier named Convict 224, which he exhibited at the first Irish Kennel Club show in 1920. At that time, the breed became fashionable as a macho symbol for young men. It’s still plenty macho and mischievous — like any good Irishman! The Irish Soft-Coated Wheaten Terrier. Photography by Kate Grishakova / Shutterstock. In Ireland, the breed is known as the Irish Soft-Coated Wheaten Terrier. After all, it would just be dumb to give up the claim to ownership of this leprechaun of dogdom. Established by the 1800s, this Irish dog breed was an all-around farm dog, exterminating vermin, guarding the homestead and rounding up livestock. 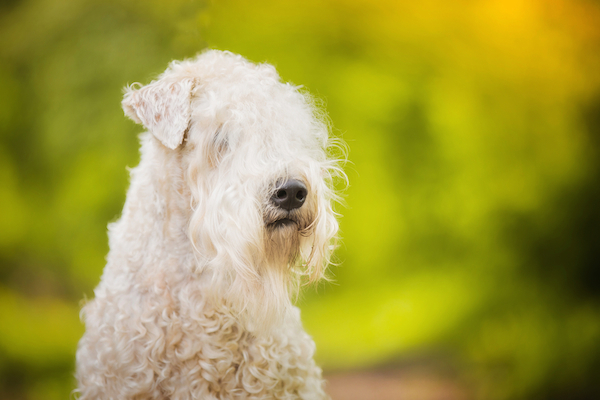 The Irish Soft-Coated Wheaten Terrier was officially recognized as a breed in 1937 in its native Ireland, but only in 1973 did the AKC recognize it. The dog’s playful nature has endeared the breed to people around the world. Of course, as you know, on St. Patrick’s Day, everyone is Irish — even the dogs! Thumbnail: Photography by DragoNika / Shutterstock. Caroline Coile is the author of 34 dog books, including the top-selling Barron’s Encyclopedia of Dog Breeds. She has written for various publications and is currently a columnist for AKC Family Dog. She shares her home with three naughty Salukis and one Jack Russell Terrier.